Windows Defender Antivirus is available on Windows Server 2016. In some instances it is referred to as Endpoint Protection - however, the protection engine is the same. By default, Windows Defender AV is installed and functional on Windows Server 2016. The user interface is installed by default on some SKUs, but is not required. You can't uninstall the Windows Security app, but you can disable the interface with these instructions. If the interface is not installed, you can add it in the Add Roles and Features Wizard at the Features step, under Windows Defender Features by selecting the GUI for Windows Defender option. See the Install or uninstall roles, role services, or features topic for information on using the wizard. Windows Defender AV will still run normally without the user interface, but the user interface cannot be enabled if you disable the core Windows Defender feature. 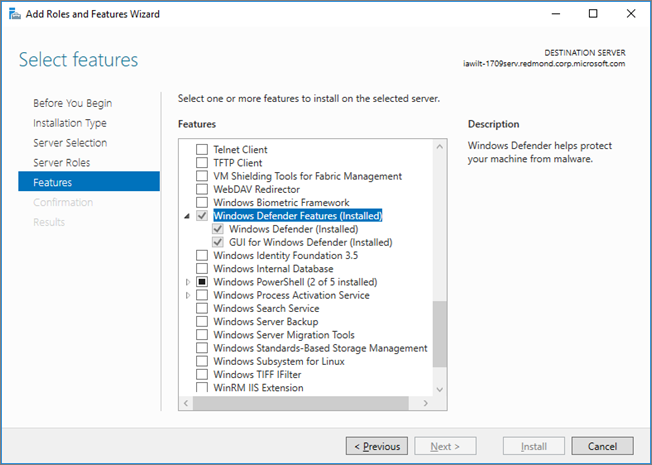 You can also uninstall Windows Defender AV completely with the Remove Roles and Features Wizard by deselecting the Windows Defender Features option at the Features step in the wizard. This is useful if you have a third-party antivirus product installed on the machine already. Multiple AV products can cause problems when installed and actively running on the same machine. See the question "Should I run Microsoft security software at the same time as other security products?" on the Windows Defender Security Intelligence Antivirus and antimalware software FAQ. Deselecting Windows Defender on its own under the Windows Defender Features section will automatically prompt you to remove the interface option GUI for Windows Defender. To install Windows Defender AV again, use the Add Roles and Features Wizard and ensure the Windows Defender feature is selected. You can also enable the interface by selecting the GUID for Windows Defender option. Event messages for the antimalware engine included with Windows Defender AV can be found in Windows Defender AV Events. The sc query command returns information about the Windows Defender service. If Windows Defender is running, the STATE value displays RUNNING. In order to get updated antimalware Security intelligence , you must have the Windows Update service running. If you use an update management service, like Windows Server Update Services (WSUS), make sure that updates for Windows Defender Antivirus Security intelligence are approved for the computers you manage. Windows Update in Control Panel. Install updates automatically results in all updates being automatically installed, including Windows Defender Security intelligence updates. Download updates but let me choose whether to install them allows Windows Defender to download and install Security intelligence updates automatically, but other updates are not automatically installed. The AUOptions registry key. The following two values allow Windows Update to automatically download and install Security intelligence updates. 4 Install updates automatically. This value results in all updates being automatically installed, including Windows Defender Security intelligence updates. 3 Download updates but let me choose whether to install them. This value allows Windows Defender to download and install Security intelligence updates automatically, but other updates are not automatically installed. The following table lists the services for Windows Defender and the dependent services. Windows Defender Service (Windefend) C:\Program Files\Windows Defender\MsMpEng.exe This is the main Windows Defender Antivirus service that needs to be running at all times. Windows Error Reporting Service (Wersvc) C:\WINDOWS\System32\svchost.exe -k WerSvcGroup This service sends error reports back to Microsoft. Windows Defender Firewall (MpsSvc) C:\WINDOWS\system32\svchost.exe -k LocalServiceNoNetwork We recommend leaving the Windows Defender Firewall service enabled. Sample submission allows Microsoft to collect samples of potentially malicious software. To help provide continued and up-to-date protection, Microsoft researchers use these samples to analyze suspicious activities and produce updated antimalware Security intelligence. We collect program executable files, such as .exe files and .dll files. We do not collect files that contain personal data, like Microsoft Word documents and PDF files. 0 Always prompt. The Windows Defender service prompts you to confirm submission of all required files. This is the default setting for Windows Defender, but is not recommended for Windows Server 2016 installations without a GUI. 1 Send safe samples automatically. The Windows Defender service sends all files marked as "safe" and prompts for the remainder of the files. 3 Send all samples automatically. The Windows Defender service sends all files without a prompt for confirmation. To help ensure security and performance, certain exclusions are automatically added based on the roles and features you install when using Windows Defender AV on Server 2016. See the Configure exclusions in Windows Defender AV on Windows Server topic for more information.